Yesterday, I posted that I’d taken a tasty treat as an offering to the Mermaids, as they once again were kind enough to include me in their trek to the River. Their little park, that they share with a few other ‘members’, is just a slice of heaven! Normally, I’d bring a salad of some kind to the luncheon, but I did something different this go. Truth be told, I’d forgotten to take this to the family picnic at Perfect from the previous weekend and the ingredients were just waiting there in the fridge to be used. Why not – those girls will love these. I’m thinking you will too. 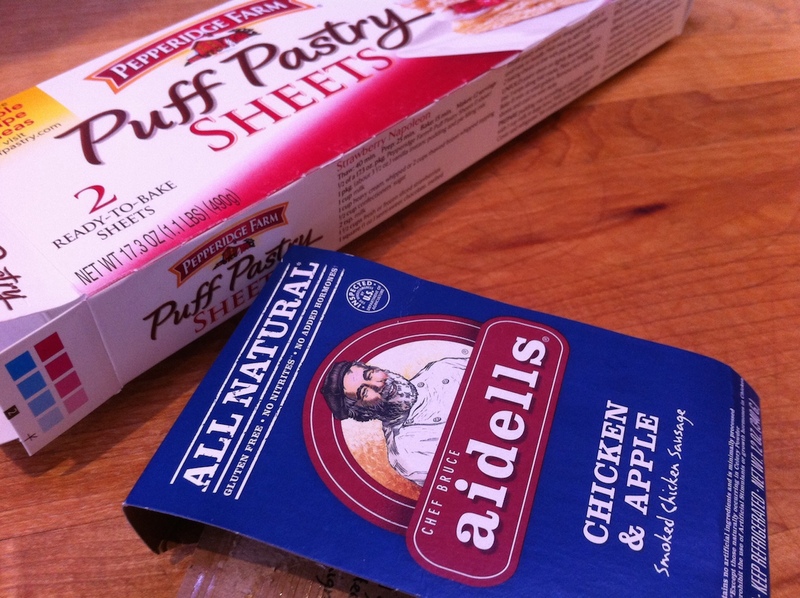 1 pkg Puffed Pastry, thawed, 4 sections of it. This is so easy, it doesn’t even need a recipe! 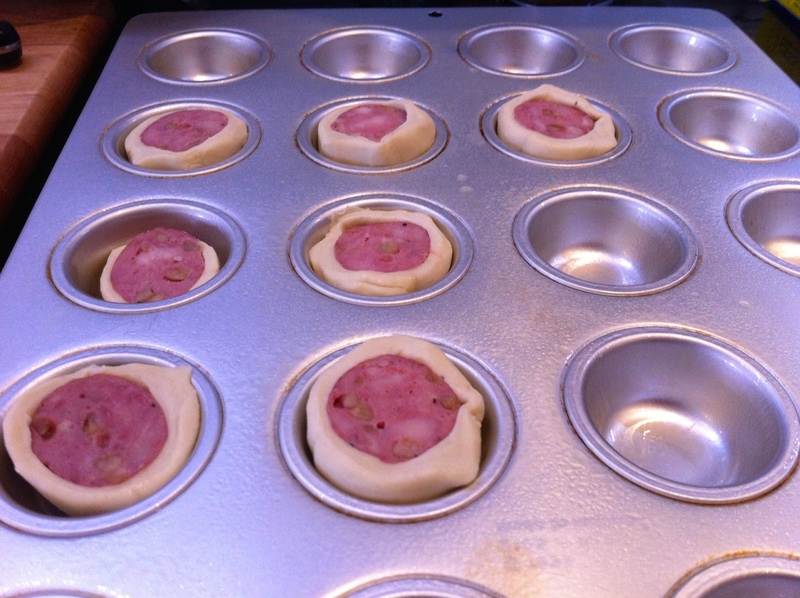 Heat the oven to 400deg., and get out a mini-muffin tin/pan. Grease it with a bit of spray. 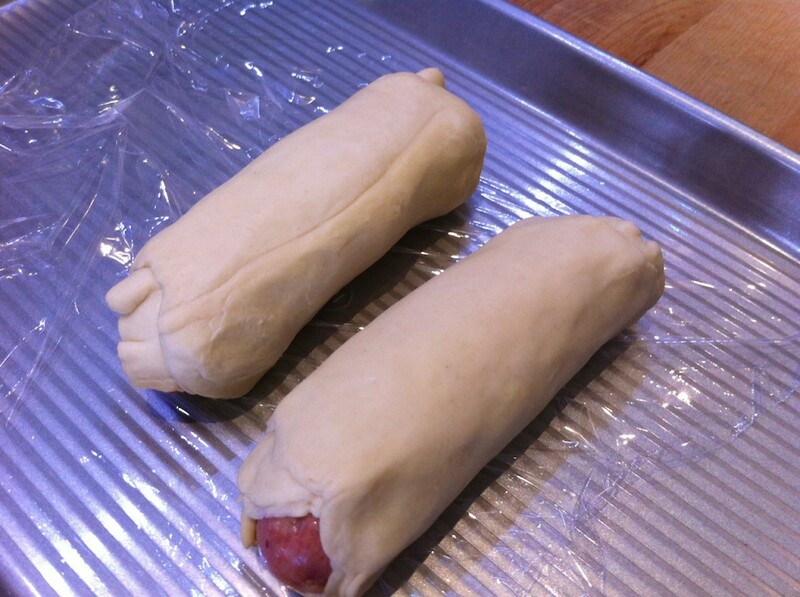 Lay out the pastry dough and roll up the sausages. If they hang over, just spread it out as you roll to cover it. 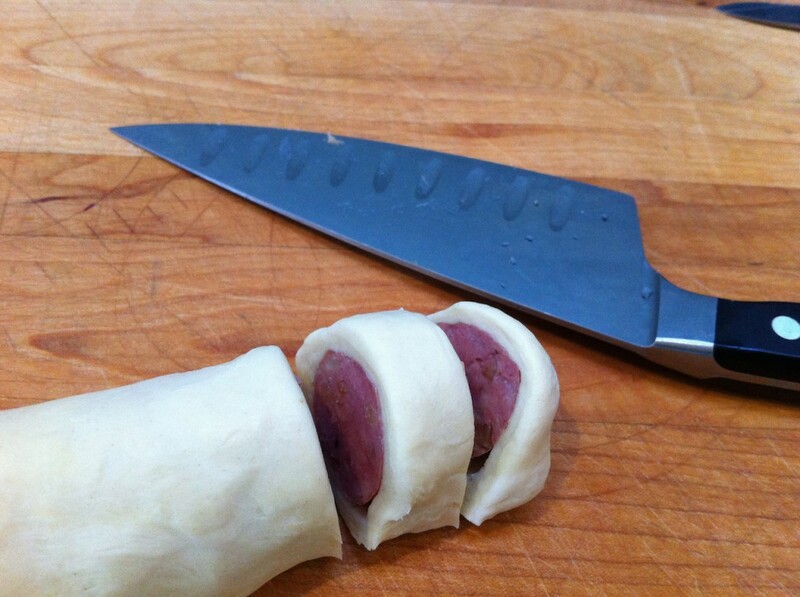 Now set the rolls in the freezer for a few minutes (10 or so) to make them easier to slice. Slice ’em up at about 1/2″ thick and lay into the wells of the muffin tin. These slices can actually be refrozen and kept for appetizers in a flash! 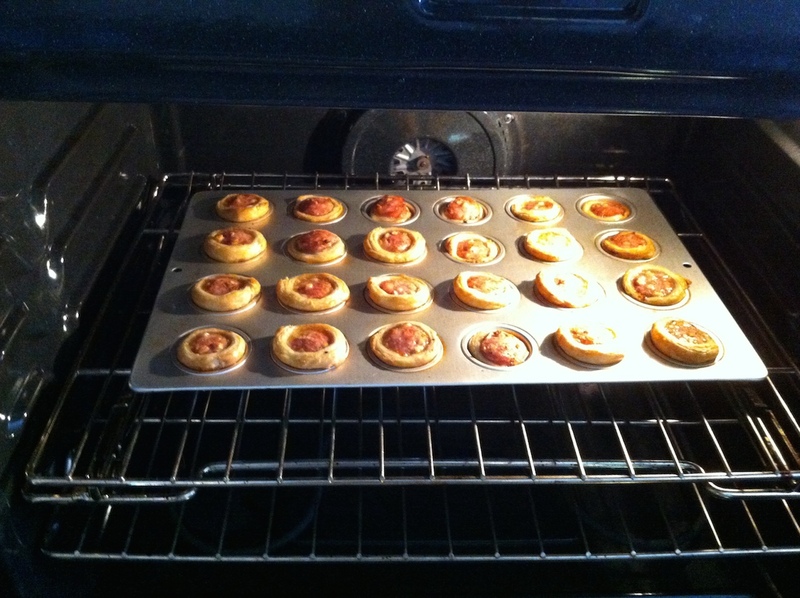 Pop them into the hot box for about 25 min or until golden brown and delicious!! Aww, you can’t smell that?! Too bad! Coax them out with a fork if need be. While they’re busy baking, you’ll have time to find some uber cool dipping sauce of homemade ketchup or fancy mustard to go with it – of course mine went to The River au natural. 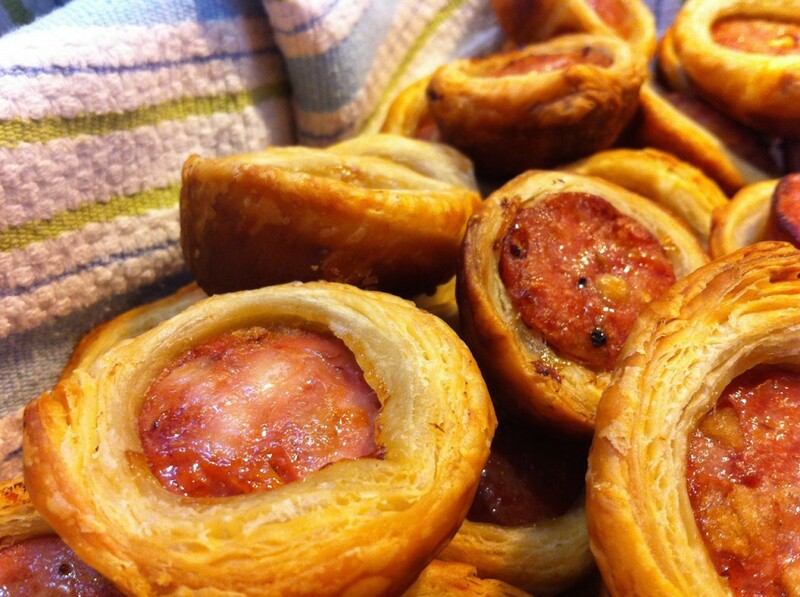 The Boys have requested that these make the official Football Food menu! This would be good with any really good sausage – Italian, or Cajun, maybe even a Kielbasa. I’m thinking it may make your man-menu too !